ItemB-01104 - Centre line on the south shore for the Fraser River Bridge in New Westminster. 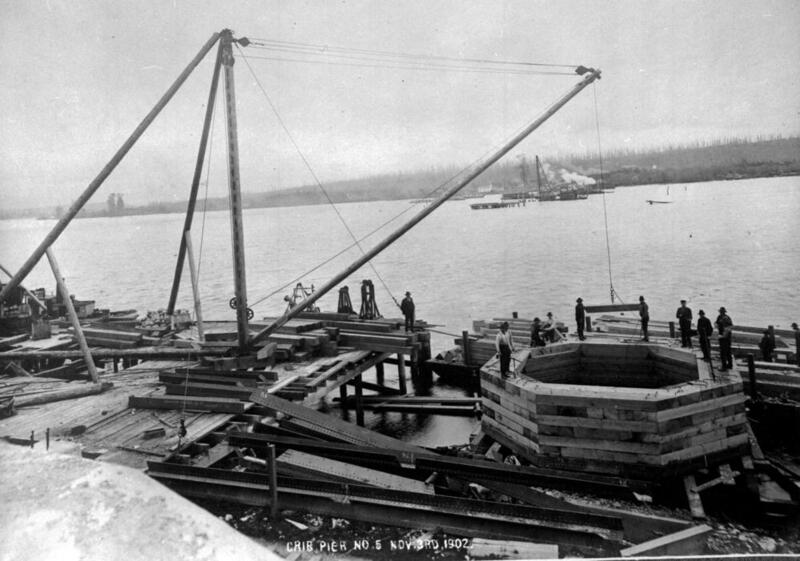 ItemB-01110 - "Blasting pier II"; construction of the Fraser River Bridge in New Westminster. ItemB-01152 - "Floating one half of the spread span"; construction of the Fraser River Bridge in New Westminster. ItemB-01153 - Construction of the Fraser River Bridge in New Westminster. ItemB-01115 - "Crib pier No. 5"; construction of the Fraser River Bridge in New Westminster. ItemB-01100 - Fraser River Bridge, New Westminster; showing piles for protection pier. ItemB-01101 - "1902 The New Westminster Bridge 1904..."; opening of the Fraser River Bridge. ItemB-01103 - The Fraser River Bridge at New Westminster. ItemB-01143 - "Coffer dam"; construction of the Fraser River Bridge in New Westminster. Item B-01115 - "Crib pier No. 5"; construction of the Fraser River Bridge in New Westminster. "Crib pier No. 5"; construction of the Fraser River Bridge in New Westminster.